The ink was hardly dry on the documents following the partition of British India in 1947 before war broke out between India and Pakistan. Since the partition, four major wars and numerous smaller conflicts have been waged over much of the same ground. In 1947, 1965, 1971, and 1999 India and Pakistan fought in the mountains of Kashmir and on the plains of the Punjab region to the south. Today, both sides are armed with thousands of armoured vehicles, hundreds of advanced aircraft, and dozens of nuclear weapons. With tensions high and both sides heavily armed, another conflict may be just a matter of time. 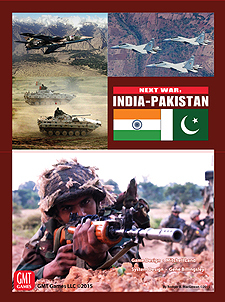 Next War: India-Pakistan, the next volume in the Next War Series is a follow-on to Next War: Korea and Next War: Taiwan, allowing players to fight a near future war between India and Pakistan. Due to the nature of a potential conflict, only a portion of the Indo-Pakistani border is featured so that the fighting centres around what it always has: the fate of the Indian state of Jamma & Kashmir. Special rules govern such things as the expanded role bridges play in the region, as well as the fact that both sides in the conflict are nuclear-armed nations. The People's Republic of China and the Untied States can make an appearance, but they might withdraw in the event of a nuclear exchange. The question is: will this war settle once and for all who will control northwest India? Next War: India-Pakistan will feature the same kinds of action as seen in the previous games, but with a single map, all the action is concentrated. New rules governing international intervention are provided so that players can pick and choose who shows up with which high-tech toys to influence the fight. With the plethora of optional rules, players can fine-tune the conflict to their desire. In addition, the Loose Nukes scenario provides a wild and woolly experience from the get-go as both sides race to secure Pakistan's nuclear weapons. NWIP brings the Next War Series action back to its roots in combined arms land warfare. The familiar rules system allows players to dig right in, but the new situation produces a new gaming experience even for Next War Series veterans. Next War Series Note: the Next War Series is not an introductory wargame. Rather, we have intended herein to create a system (and a series) that will allow detailed study of modern warfare in various venues as well as engaging gameplay. That said, the Standard Game rules encompass a fairly straightforward rule set that will, we think be considered easy to learn by experienced wargamers. So, players who choose to play Standard Game scenarios can have a relatively quick game when that's what suits them. However, the real flavour of a war in this theatre comes through in the Advanced Game, where you get much more control over airpower and can more clearly see each side's strengths and weaknesses. For players who want a mini-monster game experience, playing the Advanced Game Campaign Scenarios with some or all of the optional rules will definitely deliver. Ownership of Next War: Korea or Next War: Taiwan is NOT required to play.